Never in a million years would I thought that I would visit an Acupuncturist for treatment, but when the pain gets to so excruciating to where you can’t eat or sleep; you need to take action. I visited a very kind doctor today who studied in China and has been practicing both the science of acupuncture and herbology for over 30 years. Yes, I have trusted the medical world for almost 13 years of battling this debilitating disease. I just feel that the some of the medical doctors are not getting it. They are not listening to we Sarcoidosis patients are saying to them. They are not investing time in learning new methods of diagnosis and treatment for Sarcoidosis. The result of my visit to the Acupuncturist was very relaxing. I was able to sleep soundly for two hours after that and the pain decreased throughout my left side which has been really problematic for over a year. I called my sister who is also going through the same symptoms as me and told her that I would recommend that she try this treatment also. The doctor really listened to me and focused on my most problematic areas as well as educate me on the procedure and what to expect. I really believe that I will be able to come off of some of these meds if the treatments continue to have these results. I am looking forward to that. That feeling of being sick and tired of being sick and tired. I am pretty sure you know this as well. A month ago I was rushed to the emergency room, yet again, for excruciating pain throughout my body but also chest pain. After waiting two hours in the waiting room before even being triage’d, I was ready to leave. Hearing my name being called was a relief, at least I thought it was. Blood pressure normal, temperature normal, gave all of my symptoms and when they increased and finally insurance information given. Next I was put in a room to wait for an EKG. Forty-five minutes later, EKG normal and moved to a different room. Finally, the doctor comes in to see me. Nice ER doctor, but clueless to Sarcoidosis. No chest X-ray ordered, standard blood test ordered and drawn and told asked if I would like pain medication. Of course I said no. How could order pain medication if you do not know what is wrong with the patient. I’m just asking? When I said, “No”, the ER doctor gave me a thumbs up like I did something great??? Any-who, the ER doctor told me that I would be admitted for observation because I came in with chest pain and it is protocol for a person to be admitted. Question, what about my overall pain? Shouldn’t you call my doctors that I told you about that are treating me for the Sarcoidosis/Fibromyalgia? After 48hrs. I was discharged with an order to contact and follow-up with my cardiologist. <SMH> This is the story of the life of a Sarkie. 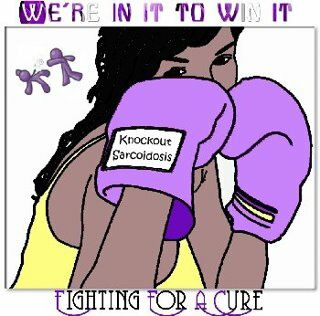 All and all, I will continue to smile through the pain, fight the good fight and spread Sarcoidosis awareness. God is still able to do the unbelievable.